John Deere Financial has announced a new finance programme for UK customers of the company’s comprehensive compact tractor range, which includes 1R, 2R, 3R and 4R Series models from 25 to 66hp. Available to business customers until further notice, the offer is for 4 + 44 monthly repayments at an overall flat interest rate per annum of only 1 per cent, based on 60 per cent of the recommended retail price. Taking as an example the 1026R (pictured) – which is the smallest compact tractor model in the John Deere range – an initial financed payment of £586.16 would be followed by 44 payments of £146.54, based on a retail price of £11,273 and a net deposit of £2029.20, giving a representative APR of just 3 per cent. The VAT can be paid in total on signing a hire purchase agreement, or on each payment on a finance lease scheme. Advanced technology features on John Deere compact tractors include LoadMatch, MotionMatch and SpeedMatch operating modes for maximum versatility in a wide range of tractor applications. There is also a choice of AutoConnect drive-over rotary mower decks and, on selected models, the award-winning Hitch Assist system, which makes coupling up implements and trailers to the tractor’s rear hitch quicker, easier and safer. 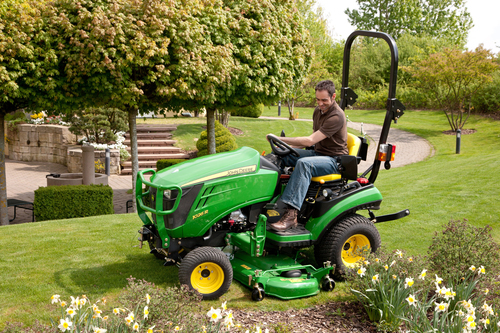 Other credit profiles are available on request, and the availability of finance is subject to status and to the usual terms and conditions – further details are available at www.JohnDeereFinancial.co.uk or from John Deere dealers nationwide.